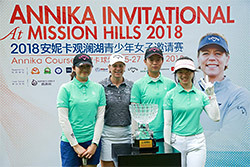 The ANNIKA Foundation – golf Hall-of-Famer Annika Sorenstam’s charitable organization – will once again bring its ANNIKA Invitational at Mission Hills to the Annika Course at China’s Mission Hills Resort, February 27 to March 1. More than 90 girls hailing from eight different countries and territories (Canada, China, Chinese Taipei, Hong Kong, Japan, Macau, Singapore and the United States) will compete over 54 holes of stroke play. They will be broken into three age groups (8-9, 10-12, 13-18). The overall champion will receive invitations to compete in the EFG Hong Kong Ladies Open, May 10-12, 2019, and CLPGA’s Zhangjiagang Shuangshan Challenge, June 6-8, both professional events. Top-three overall finishers will earn exemptions into the prestigious 2020 ANNIKA Invitational USA presented by Rolex at the World Golf Village in St. Augustine, Florida. World Amateur Golf and China Golf Association ranking points are also up for grabs. Japan’s Nanako Inagaki will return to defend her title. She will once again be challenged by Chinese Taipei’s Yi Ting Chou, who will be playing in her fourth ANNIKA Invitational at Mission Hills and finished T-3 in 2018. Three Americans (Ella Peiwei Han, Obi Chan and Yiyun Zou) are also scheduled to compete. Following the ANNIKA Foundation’s “More Than Golf” mantra, Annika will spend time with the players both on and off the course, sharing the knowledge and experiences that have made her incredibly successful in both the LPGA and post-LPGA phases of her life. Activities will include a clinic, tournament dinner and talent show. Each year, the ANNIKA Foundation conducts five other major golf events for juniors: the ANNIKA Invitational USA presented by Rolex, ANNIKA Invitational Europe, ANNIKA Cup, ANNIKA Invitational Latin America and ANNIKA Invitational Australasia. They are complemented by the ANNIKA Intercollegiate presented by 3M and the ANNIKA Award presented by 3M, which is annually bestowed to the most outstanding female Division I golfer. Since the inaugural Foundation tournament – the 2009 ANNIKA Invitational USA – 45 ANNIKA event alumnae have earned LPGA cards, with more than 600 playing golf at the collegiate level. For more information, please visit www.annikafoundation.org. Annika created the ANNIKA Foundation to provide opportunities in women’s golf at the junior, collegiate and professional levels while teaching young people the importance of living a healthy, active lifestyle through fitness and nutrition. The Foundation has partnered with key organizations to promote healthy, active lifestyles for children, including SPARK, Florida Hospital for Children in support of its Healthy 100 Kids initiative and The First Tee in development of the Nine Healthy Habits curriculum for children. It annually conducts six major golf events for aspiring junior girls: the ANNIKA Invitational USA presented by Rolex at the World Golf Village in St. Augustine, Florida; ANNIKA Invitational at Mission Hills in China; ANNIKA Invitational Europe and ANNIKA Cup in Sweden; and, in association with the R&A, the ANNIKA Invitational Latin America and ANNIKA Invitational Australasia. In 2013, the Foundation’s reach extended to the collegiate ranks with the ANNIKA Award presented by 3M (awarded to most outstanding female NCAA Division I golfer) and ANNIKA Intercollegiate presented by 3M (12 team, 54-hole event in Minnesota). SPARK grants to schools, financial support of Healthy 100 Kids, endowing an AJGA ACE Grant, and the “Share My Passion” Golf Clinics are other areas of emphasis. The fully-integrated Mission Hills resorts sprawl over 40 square kilometres, including 22 championship golf courses, five-star hotels, award-winning spas and volcanic mineral springs, international convention centers, state-of-the-art golf academies, a 20-pitch soccer training base, Asia’s largest basketball school and Asia’s biggest tennis facility.